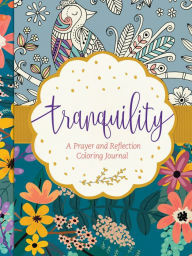 Tranquility: A Prayer and Reflection Coloring Journal by Tyndale a beautiful little gift book that cannot easily be placed in one single genre. Although its title mentions "coloring" and "journal", this book is a hyrbid devotional first and foremost with a number of beautiful and intricate illustrations perfect for coloring with colored pencils. In some form or another, illustrations and even serene photos adorn each page. Unlike other coloring books or devotionals which can seem monotonous or repetitious, there is a lot of original content and variation from page to page to keep the reader engaged. There are a lot of unexpected little details in this book. On some pages, they span across a full page or even a two page spread like a traditional adult coloring book. On other pages, small decorative illustrations are used either as a border or a decorative accent- which can also be colored. Some pages feature full color graphics and art. Most pages feature a short devotional entry based on a scripture or theme making this a devotional book. There is also lined space for journaling as well as blank page space for free writing or free drawing and doodles. This book allows for a great amount of creativity. This is a beautiful keepsake for yourself or to give as a gift to a loved one. As a blogger I received a copy of this book for the purpose of writing this review. This book is part of the Living Expressions collection.